Adaptations of Shakespeare, as of anything sui generis, are tricky. Shakespeare’s plots are derivative, pulled from history or earlier plays and tales; what makes Shakespeare Shakespeare is the poetry, the depth of characterization, the verbal pyrotechnics of the plays, and these, of course, cannot be adapted in the way that a story can be. But it’s fun to watch talented people try, isn’t it? In this case, Ms. Winterson pulls the plot of The Winter’s Tale four hundred years into the future and hundreds of miles west; Sicilia is now a large company in London headed by Leo, and Bohemia is now New Bohemia, a New Orleans-type city in North America, the occasionally home to Leo’s best friend, Xeno. Hermione is now the Parisian singer MiMi, married to Leo and expecting his second child. In a fit of cruel and unfounded jealously, Leo accuses Xeno of sleeping with MiMi (and fathering her child), attempts to kill him, and provokes MiMi’s early labor. When Perdita is born, Leo has her spirited away, which leads indirectly to his young son’s death and MiMi’s disappearance. Fast forward sixteen years. Perdita has been raised by the kindly Shep and his son Clo, and through a series of improbabilities, comes to fall in love with Xeno’s son, Zel, and learn of her unusual parentage. Next stop: a very awkward family reunion. Though she generally adheres to the five-act structure of the original play (including two “intervals”), and weights the first half with more psychosexual tension than a bevy of Freudians would know what to do with, Ms. Winterson makes one break that I found dramatically useful: she begins the tale with the scene of Perdita’s accidental abandonment and subsequent rescue by Shep, a grieving widower and musician. This change heightens the tension and gives readers something to look forward to as they read the sordid story of Leo and Xeno; here, as in the play, it’s not at all clear what MiMi saw in Leo in the first place. The book participates in the oddness of its source material’s plot and characters while retaining its themes: loss, forgiveness, remorse, grief, the startling power of music and imagination. Ms. Winterson’s writing is studded with lovely metaphors (“Milo stood between them like a lighthouse between the rocks and the shipwreck”), images (“he could only look at her through the kaleidoscope cut-outs of the crowd”), and wry observations (“one thing you’ll notice about progress, kid, is that it doesn’t happen to everyone”), self-referential asides, and overt references to the play. Autolycus’s (here, perfectly, a used car dealer) jokes fall flat, but then, I never enjoyed them in the original, so maybe that’s intentional. 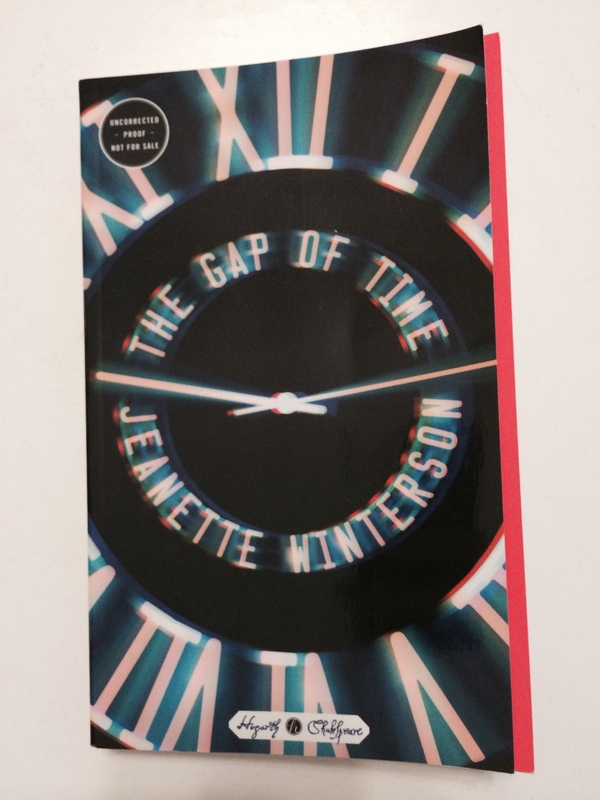 Nevertheless, The Gap of Time is engaging, a fast read that Shakespeare stalwarts will find thought-provoking and fans of quirky, genre-bending fiction will appreciate. This is the first in Hogarth’s planned series of Shakespeare adaptations that will roll out more frequently next year (to mark the 400th anniversary of the Bard’s death); authors tapped include Margaret Atwood (! ), Gillian Flynn, and Jo Nesbo. What’s your favorite Shakespeare adaptation, Dear Readers? And has anyone read Ms. Winterson’s other work? What should I be on the lookout for? *I received a review copy of this book from the publisher for review consideration, which did not affect the content of my review. If you haven’t read it yet, Oranges are Not the Only Fruit is an excellent read by Winterson. It is a semi-autobiographical tale of her growing up in Northern England and coming to terms with her religion and sexuality. I have her more recent memoir also bbut I hvaen’t had a chance to read it yet. As for the modern adaptations they do take some getting used to. It’s no shock but I love Jane Austen adaptations, but there are so many that are just bad. The names of those authors make me think these will be great, similar to the re-imaginings of The Austen Project. I haven’t read it yet! This was my first Winterson. Thanks Geoff! Do you have a favorite Austen adaptation? I can’t say that I’ve read any, come to think of it. I second Geoff’s recommendation of Oranges are not the Only Fruit. My favorite books of hers, though, are Lighthousekeeping and The Passion. I am really excited to get my hands on The Gap of Time! Thanks, Jessica! I will keep my eyes open for those the next time I’m in a used bookstore! Hmm, it’s been a while since I’ve read A Winter’s Tale. I only remember Perdita. I’ll have to read that again first if I decide to read this one. I liked Winterston’s The Daylight Gate, though, about witches in the 17th century. 17th-century witches? SIGN ME UP, yo. LOL! BTW, I just finished reading Stacy Schiff’s The Witches. Very good. I think you already reviewed it, didn’t you? I did, when it first came out–should be in the October archives. I liked it too! True confessions — I never liked Shakespeare, and I doubt I’d understand the adaptation. But how fun is this review? I love reading this blog just for the author’s commentary. You just haven’t read Shakespeare with me yet.